Coralie Bickford-Smith, a senior cover designer at Penguin books, designed a series of graphic covers for a selection of Penguin Classics. I saw them in the home of Nicole Hill Geralut on Design*Sponge and immediately linked to Amazon to get my hands on a selection. The good news? These hardback beauties are currently on sale for $13.60! Stock up now! These books are like art for your shelves and make great holiday gifts. I adore the striking color combinations and admire the detail that went into creating these beautiful grid patterns. The Picture of Dorian Gray might be my favorite with its peacock feathers done in the ultimate contrast (see black and white book cover below). But I'm thinking... Pride and Prejudice, Sense and Sensibility and Jane Eyre will be the first in my shopping cart. ***UPDATE I caved and bought The Picture of Dorian Gray, as well. I've always wanted to read it and now with the kick-a** new movie coming out, I couldn't resist. These are so great. I love the look of books that have covers on them. It makes them look like they belong on the shelf together! I like the dark blue one. It'd be cool if you could choose a colored cover for the books you like. I feel like that could be a good business idea. Also, where did the link go where you can rate each post? I really want to buy some of these too! 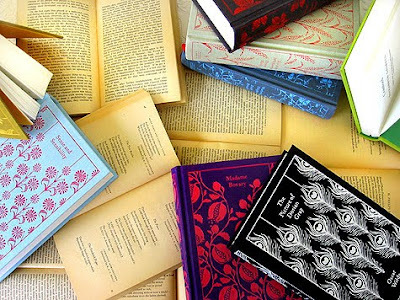 Good literature, and they're pretty! 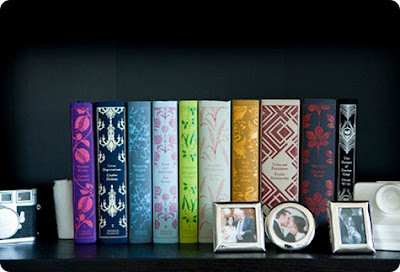 Perfect way to add a jolt of color to your shelves. These designs are really beautiful! 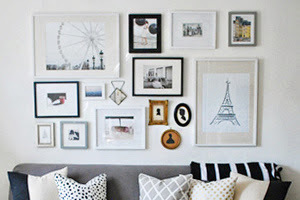 Kissairis showed me your blog and I love it! great finds! 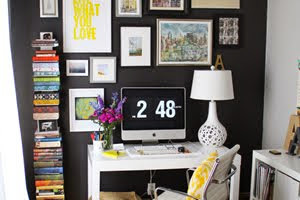 I've been wanting to spruce up my bookshelf- how perfect! I love these too. Have been on my "wishlist" for awhile, but I'm getting closer to just caving and hitting the "buy" button - I want them!